Everyone makes mistakes but when it comes to business, making mistakes can have a lasting effect. Last week, horror swept the nation, KFC was in crisis – they ran out of chicken! As things go, that’s a pretty big mistake to try and come back from! 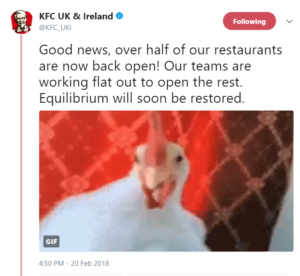 As KFC stores around the country closed the news quickly spread, and as panic set in, people took to social media to complain (With an inevitable barrage of GIFs and talk of a looming apocalypse). No one would envy the social media, marketing and PR teams at KFC last week. But they got through it. In fact, the way the situation was handled and a potential PR nightmare was spun into positive press is admirable. 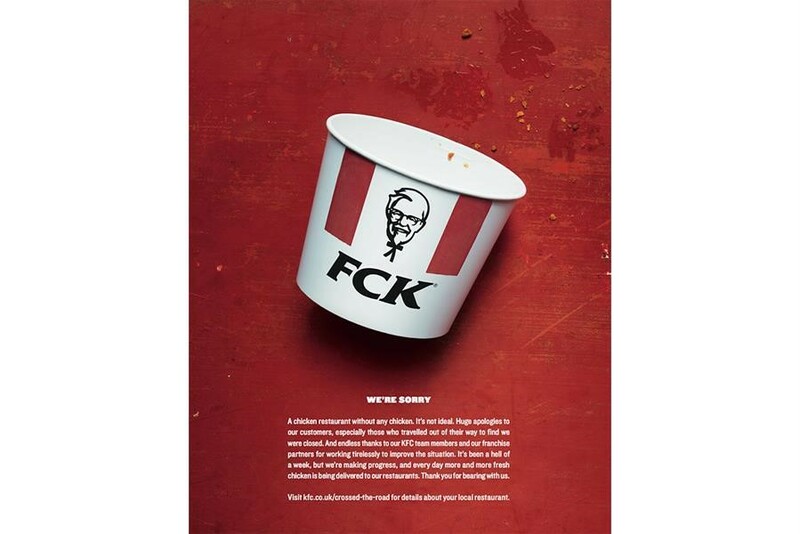 Using some clever crisis management and quick-thinking marketing, KFC came out on top. Whilst the #Chickengate saga will no doubt be remembered as one of the lighthearted news moments of 2018, KFC won’t forget it quickly or the lessons they learned along the way. In times of crisis, communication with your audience is even more important. So is making sure the right communication is going out at the right time. If your social channels are being bombarded with complaints, you still have planned content going and aren’t responding to customers you’re likely to ruffle some feathers! 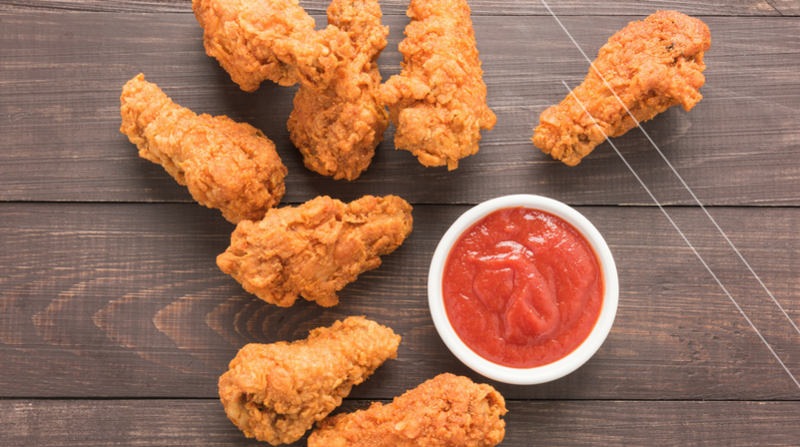 KFC used social media to keep customers updated in real-time. Used incorrectly this could have received backlash, but the benefits far outweighed the risks. It’s not just communication with your audience that is important, communication within your business needs to be fast and accurate. Social media managers and marketers putting out real-time messages need to be kept up-to-date of any crisis; this ensures any messages going out to your audience are accurate and suitable for the current situation. For global businesses, communication can be an issue. but the relationship between the wider business and marketing team or associated agencies needs to be strong – especially in times of crisis. Unless you have a crystal ball you can’t always predict how a business action or marketing activity will be received by your audience. Sometimes circumstances that affect your business are out of your hands. But regardless, you should have a clear strategy for if the worst does happen and how you will manage it. Your PR, marketing and social media teams need to be aligned and ready to respond ASAP and demonstrate a united front. If you are working with multiple agencies, or across regions, everyone needs to know who to go to and what to do in a crisis. Departments and agencies need to be able to work together to resolve any issues that crop up. Sometimes mistakes do happen. Whether it’s a small error within your marketing content or a big issue that impacts business, you and your marketing team should be prepared to rectify mistakes and when needed own up and be honest about it! 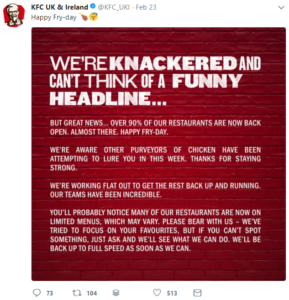 KFC quickly put their hands up and tried to manage customer expectations by providing real-time updates via social media. Most importantly, they acknowledged they were at fault and apologized. 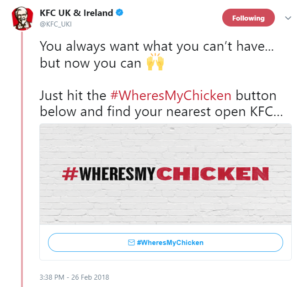 The KFC’s cheeky response to the crisis got people talking and changed the conversation putting KFC firmly back in control. When reacting to a crisis your message must remain on brand, but sometimes it pays to respond creatively and take a risk. KFC did just that, they responded quickly with a simple and effective apology. Nothing fancy, or too over thought, and it’s worked wonders! 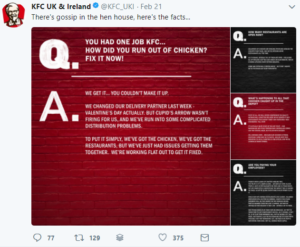 KFC PR, marketing and social media team – we raise our hat to you! BREAKING NEWS! KFC just announced it’s running low on gravy! Can PR success strike twice? It’s the only industry recognized accreditation for B2B Oracle Eloqua and shows recognition of best practices within marketing automation platforms.